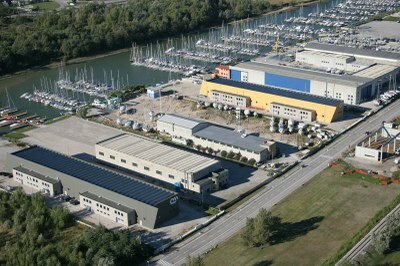 Lisert Nord includes the industrial area between Via Terza Armata and the residential outskirts of the city of Monfalcone. The short distance to the highway A4 Venice-Trieste and the excellent railway connections have guaranteed the success of many manufacturing industries settled in this area, facilitated by an efficient logistics system and road/rail transport facilities. This area extends along the waterway called Canale est-Ovest, built in the thirties of the last century by the Consorzio di Bonifica del Lisert (Consortium for reclaiming) and currently granted to the Consortium. The companies located in this area mostly belong to the leisure boat industry and benefit from the waterway and the extraordinary natural conditions. The nautical center promoted by the projects of the Consortium is in continuous development and boasts artisanal productions of national standing. This area is situated at the back of the commercial port of Monfalcone and is home to many companies dealing with transportation, papermaking, steel carpentry and chemistry which are related to the port activities. The area extends for about sixty acres bordering the area of boating industry next to the waterway Canale Est Ovest. The excellent intermodality, based on facilities planed by the Consortium, exploits the synergistic opportunities of road, water and rail transport. Also there is the largest power station of Friuli Venezia Giulia with four multifuel groups and a production capacity of over 900 megawatts.